Remark: All functions in this chapter refer to Access / Office 2010. 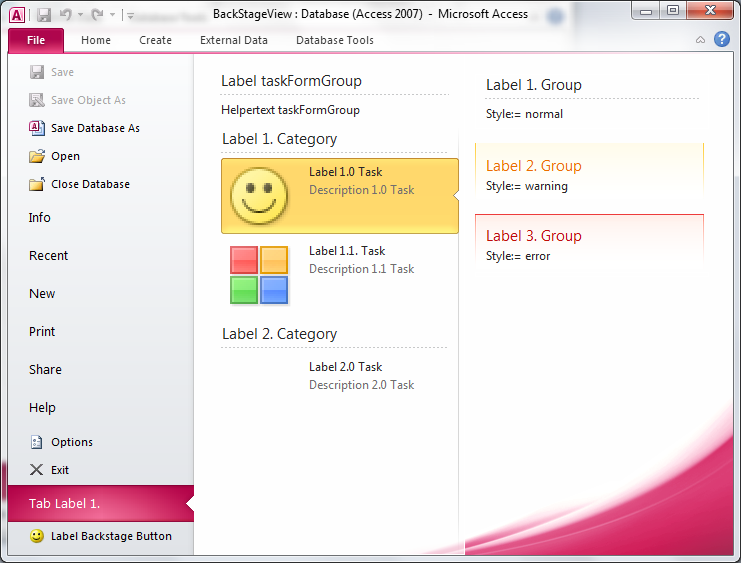 One of the major Ribbon changes in Office 2010 is the Backstage View, opened by click on the new Office Button. Backstage View replaces the Office Menu of Office 2007. High degree customization is possible. Elements can be hidden / unhidden and user-defined areas can be developed. Amongst others Dialog Ribbon Controls can be used. Backstage View can be controlled by the Navigation Pane and is split into different areas called tab. When opening an area you can see the content of the relevant Tab. A Tab can have 2 columns. Picture: Backstage View showing opened entry (Tab) with two columns (firstColumn and secondColumn). Picture: Navigation pane of Backstage View in Access 2010. All entries can be removed. However, another caption can be assigned to the entry. All Controls of the Backstage View can you find under: Ribbon XML / Controls. You can also find this sample in sample database "Backstage View".